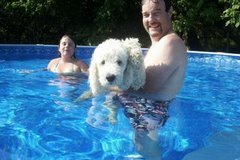 An ongoing chat about knitting, rambling thoughts, kids, knee surgery, big giant poodle heads-whatever strikes my fancy-from a 40-something mother and wife in Ontario, Canada. 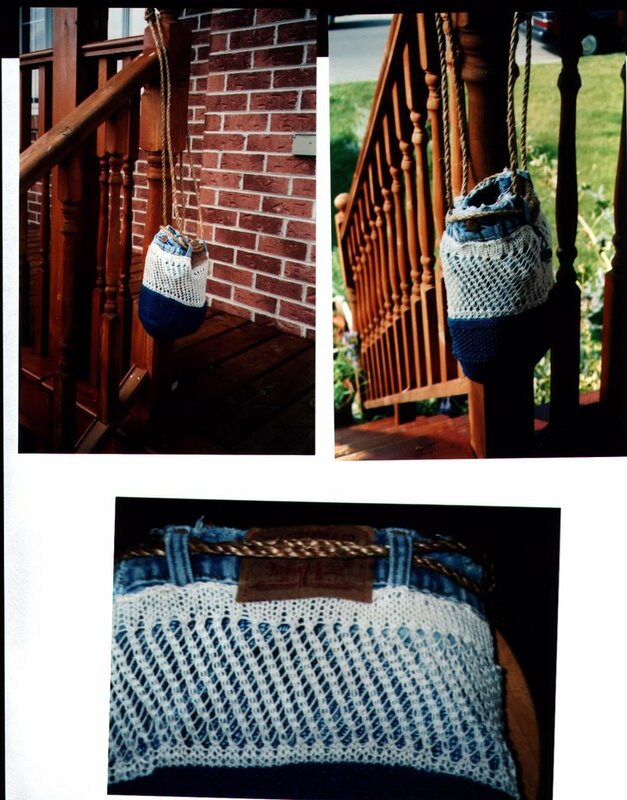 These are pics of a purse I made (2 years ago, as a matter of fact) from some Rowan denim and some un-named off white cotton. I used some old OLD jeans to trim it, some hemp cord as the handle, and lined it with some cotton. It went to a niece. (and I have written down the pattern somewhere, but there is no place to find it at this time) Brings up the question- there are tons of purse patterns out there- the felted ones, the knit ones, the crochet ones-as well as fabric ones (my younger sister makes fabulous purses)-Is there a trend to make and actually USE these purses? I see people making them all over the blogs- but are they USING them? Or do they still look too "home- made-y" (yes, made up a word). I like things to look polished, professional, and some of those purses just do not. If you go and check out http://www.youknitwhat.blogspot.com/ you will see all kinds of things that probably looked great in a designer's mind, but, Holy Cow- not great in reality. I like this little purse I made, would probably have used it if it hadn't been a gift. But tell me, all 3 or 4 readers of this blog- do you use the purses you have made? I am currently involved in a sock kit swap, and I certainly hope the person getting the kit I have put together likes the bag I have made. 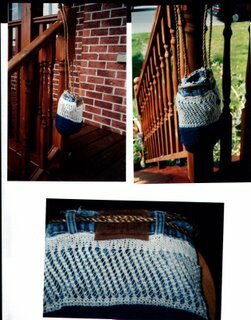 It was originally a purse pattern, but it looked more like a knitting bag to me. I just hope she likes it enough to use it. I made a felted napsack from one of the knitter magazines a few years ago and I love it. I use it everyday for my work tote. When it wears out I'll make another. We also made one at our guild that one of the members designed. It was an entrelac pattern but it didn't suit my taste. I think there are lots of nice patterns out there you just have to find the right one for you. So far the felted bags I've made were used, but only for a short period of time. My favorite purse (bag) is one I made out of an old pair of kacky colored pants. It's rectangular with the pocket used on the front as a chapstick keys pocket. It has a long handle made out of same material and I sling this over my head and shoulder and use it whenever i use a purse. I think its the felted ones I don't really like. I like making them but not using them, so far. Although I am considering felting a tote for my laptop. Now THAT I might use. Hope that helps. The knee problem has been solved!